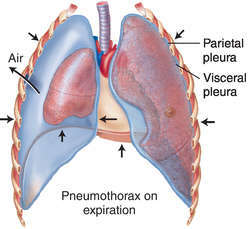 Pneumothorax is a collection of air or gas in the chest or pleural space that causes part or all of a lung to collapse. Normally, the pressure in the lungs is greater than the pressure in the pleural space surrounding the lungs. However, if air enters the pleural space, the pressure in the pleura then becomes greater than the pressure in the lungs, causing the lung to collapse partially or completely. Pneumothorax can be either spontaneous or due to trauma. If a pneumothorax occurs suddenly or for no known reason, it is called a spontaneous pneumothorax. This condition most often strikes tall, thin men between the ages of 20 to 40. In addition, people with lung disorders, such as emphysema, cystic fibrosis, and tuberculosis, are at higher risk for spontaneous pneumothorax. Traumatic pneumothorax is the result of accident or injury due to medical procedures performed to the chest cavity, such as thoracentesis or mechanical ventilation. Tension pneumothorax is a serious and potentially life-threatening condition that may be caused by traumatic injury, chronic lung disease, or as a complication of a medical procedure. In this type of pneumothorax, air enters the chest cavity, but cannot escape. This greatly increased pressure in the pleural space causes the lung to collapse completely, compresses the heart, and pushes the heart and associated blood vessels toward the unaffected side. Spontaneous pneumothorax. Simple spontaneous pneumothorax is caused by a rupture of a small air sac or fluid-filled sac in the lung. It may be related to activity in otherwise healthy people or may occur during scuba diving or flying at high altitudes. Complicated spontaneous pneumothorax, also generally caused by rupture of a small sac in the lung, occurs in people with lung diseases. The symptoms of complicated spontaneous pneumothorax tend to be worse than those of simple pneumothorax, due to the underlying lung disease. Spontaneous pneumothorax is characterized by dull, sharp, or stabbing chest pain that begins suddenly and becomes worse with deep breathing or coughing. Other symptoms are shortness of breath, rapid breathing, abnormal breathing movement (that is, little chest wall movement when breathing), and cough. Tension pneumothorax. Following trauma, air may enter the chest cavity. A penetrating chest wound allows outside air to enter the chest, causing the lung to collapse. Certain medical procedures performed in the chest cavity, such as thoracentesis, also may cause a lung to collapse. Tension pneumothorax may be the immediate result of an injury; the delayed complication of a hidden injury, such as a fractured rib, that punctures the lung; or the result of lung damage from asthma, chronic bronchitis, or emphysema. Symptoms of tension pneumothorax tend to be severe with sudden onset. There is marked anxiety, distended neck veins, weak pulse, decreased breath sounds on the affected side, and a shift of the mediastinum to the opposite side. To diagnose pneumothorax, it is necessary for the health care provider to listen to the chest (auscultation) during a physical examination. By using a stethoscope, the physician may note that one part of the chest does not transmit the normal sounds of breathing. A chest x ray will show the air pocket and the collapsed lung. An electrocardiogram (ECG) will be performed to record the electrical impulses that control the heart's activity. Blood samples may be taken to check for the level of arterial blood gases. A small pneumothorax may resolve on its own, but most require medical treatment. The object of treatment is to remove air from the chest and allow the lung to re-expand. This is done by inserting a needle and syringe (if the pneumothorax is small) or chest tube through the chest wall. This allows the air to escape without allowing any air back in. The lung will then re-expand itself within a few days. Surgery may be needed for repeat occurrences. Most people recover fully from spontaneous pneumothorax. Up to half of patients with spontaneous pneumothorax experience recurrence. Recovery from a collapsed lung generally takes one to two weeks. Tension pneumothorax can cause death rapidly due to inadequate heart output or insufficient blood oxygen (hypoxemia), and must be treated as a medical emergency. Preventive measures for a non-injury related pneumothorax include stopping smoking and seeking medical attention for respiratory problems. If the pneumothorax occurs in both lungs or more than once in the same lung, surgery may be needed to prevent it from occurring again. Electrocardiagram — A test that provides a typical record of normal heart action. Mediastinum — The space between the right and left lung. Pleural — Pleural refers to the pleura or membrane that enfolds the lungs. Thoracentesis — Also called a pleural fluid tap, this procedure involves aspiration of fluid from the pleural space using a long, thin needle inserted between the ribs. American Association for Respiratory Care. 11030 Ables Lane, Dallas, Texas 75229. (972) 243-2272. http://www.aarc.org. accumulation of air or gas in the pleural cavity, resulting in collapse of the lung on the affected side. The condition may occur spontaneously (spontaneous pneumothorax), as in the course of a pulmonary disease, or it may follow perforating trauma to the chest wall or lung parenchyma (traumatic or open pneumothorax). Spontaneous Pneumothorax. This condition occurs when there is an opening on the surface of the lung allowing leakage of air from the airways or lung parenchyma into the pleural cavity. Most often it occurs when an emphysematous bulla or other weakened area on the lung ruptures. Normally the pleural cavity is an airtight compartment with a negative pressure. When air enters the pleural cavity the lung collapses, producing shortness of breath and mediastinal shift toward the unaffected side (see also mediastinal shift). Other signs and symptoms are a sudden sharp chest pain, fall in blood pressure, weak and rapid pulse, and cessation of normal respiratory movements on the affected side of the chest. A small spontaneous pneumothorax may require no specific treatment beyond rest and administration of oxygen for relief of dyspnea. Chest x-rays should be obtained. The patient usually is more comfortable if allowed to sit up. A larger spontaneous pneumothorax may require a more aggressive approach such as aspiration to allow for reexpansion of the lung. If air continues to leak from the defect in the lung surface a continuous closed-drainage apparatus is set up (see chest tube). As soon as the lung lesion heals and the lung is reexpanded, the patient is allowed to resume usual daily activities. Guidelines for the treatment of spontaneous pneumothorax have been published by the American College of Chest Physicians and are available on their web site at http://www.chestnet.org. Tension pneumothorax. This is a particularly dangerous form that occurs when air escapes into the pleural cavity from a bronchus but cannot regain entry into the bronchus. As a result, continuously increasing air pressure in the pleural cavity causes progressive collapse of the lung tissue. Emergency aspiration of air from the pleural cavity is necessary in this disorder. If untreated, increased pressure within the pleural cavity will cause lung collapse and mediastinal shift. Pneumothorax. Air within the pleural cavity has entered some of the space normally occupied by the lung, thus preventing its expansion and causing partial collapse. The presence of free air or gas in the pleural cavity. /pneu·mo·tho·rax/ (-thor´aks) air or gas in the pleural space, usually as a result of trauma (traumatic or open p.) or some pathological process. 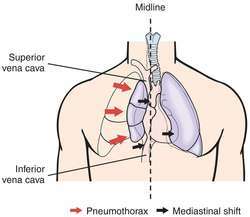 tension p. pneumothorax in which the pressure within the pleural space is greater than atmospheric pressure; as a result, the mediastinum is displaced to one side, which interferes with breathing. Accumulation of air or gas in the pleural cavity, occurring as a result of disease or injury, or sometimes induced to collapse the lung in the treatment of tuberculosis and other lung diseases. the presence of air or gas in the pleural space, causing a lung to collapse. Pneumothorax may be the result of an open chest wound that permits the entrance of air, the rupture of an emphysematous vesicle on the surface of the lung, or a severe bout of coughing. It may also occur spontaneously without apparent cause. observations The onset of pneumothorax is accompanied by a sudden sharp chest pain, followed by difficult, rapid breathing; decreased breath sounds and cessation of normal chest movements on the affected side; tachycardia; a weak pulse; hypotension; diaphoresis; an elevated temperature; pallor; dizziness; and anxiety. interventions The patient is assured that the condition can be treated, is urged to remain still, and is placed in bed in Fowler's position. Oxygen is administered through a nasal cannula, unless contraindicated, and the air in the pleural space is immediately aspirated. A chest tube is inserted and attached to an underwater seal; a waterless, disposable system; or a mobile chest drain; the tube is not removed until air is no longer expelled through the seal and a radiographic examination shows that the lung is completely expanded. Pain may be controlled by administering appropriate analgesics, but the use of respiratory depressants is avoided. Intermittent positive-pressure breathing may be administered. nursing considerations The patient is taught how to turn, cough, breathe deeply, and perform passive exercises and is told to avoid stretching, reaching, or making sudden movements. The patient is advised not to smoke but to drink fluids copiously, to exercise, to avoid fatigue and strenuous activity, and to report any symptoms of recurrence, such as chest pain, difficult breathing, fever, or respiratory infection. 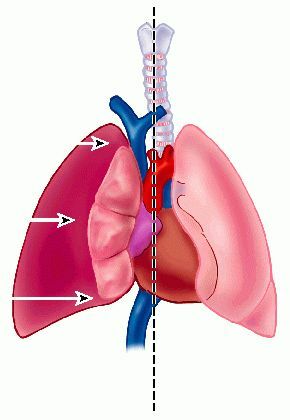 Lung collapse Pulmology The presence of air in the pleural space, which may be 1º–seen in tall, thin, young ♂, characterized by subpleural apical blebs, 2º–asthma, COPD, PCP, trauma, TB, iatrogenic–due to thoracentesis, subclavian line placement, PEEP, bronchoscopy Clinical Pleural pain, dyspnea, ↓ breath sounds, percussion hyperresonance, ↓ tactile fremitus Management Small blebs may heal spontaneously, larger pneumothoraces require chest tube drainage, pleurodesis. See Spontaneous pneumothorax. The presence of air or gas in the pleural cavity. The onset is sudden, usually with a severe sharp pain in the side of the chest, and dyspnea. The physical signs are those of a distended unilateral chest, increased resonance, decrease in or absence of breath sounds, and, if fluid is present, a splashing sound on succussion (shaking) of the patient. Patients often report chest pain is worsened by coughing, deep breathing, or movement. Treatment varies according to type and amount of lung collapse. Traumatic or iatrogenic pneumothorax requires chest tube insertion to closed (water-sealed) chest drainage for lung re-expansion. Surgical repair also may be required. Spontaneous pneumothorax may be treated conservatively with bedrest if there is no sign of increased pleural pressure, less than 15% lung collapse, no dyspnea or other indication of physiological compromise. If the patient's condition worsens or if more than 15% of the lung is collapsed, a thoracostomy tube may be placed anteriorly in the second intercostal space and attached to a Heimlich flutter valve or chest-drainage unit. If fluid is present in the pleural space, a thoracostomy tube is placed in the fourth, fifth, or sixth intercostal space more posteriorly to drain it. The patient's vital signs, chest expansion, oximetry and/or blood gases are monitored and oxygen administered to prevent hypoxia. The purpose and process for placing a chest tube are explained to the patient to allay anxiety and foster cooperation with the procedure. After the surgeon prepares and drapes the patient in sterile fashion, and administers local anesthesia, a small incision is made. A thoracostomy tube is attached to a water-sealed drainage device. The patient is placed in the semi-Fowler position to promote drainage, comfort, and ease of breathing. Vital signs and ventilatory status are monitored. Once the tube is placed, deep breathing (incentive spirometry) and coughing are encouraged (at least hourly) to promote lung expansion, with prescribed analgesics provided to control pain and discomfort (due in part to the tube itself). Ambulation is encouraged to facilitate full inspiration and enhance lung expansion. The thoracostomy tube site is kept sealed, generally by using a purse-string suture and occlusive dressing. Care is taken to avoid tension on the tubing, and all connections also are sealed to avoid air leaks. If the tube is accidentally dislodged, an occlusive (petroleum gauze) dressing is placed over the opening immediately to prevent lung collapse. When chest x-ray demonstrates adequate lung re-expansion that remains stable without suction, the thoracostomy tube is carefully removed, and the incision is covered with an occlusive dressing. The importance of follow-up examination, x-ray, and any needed care is explained prior to discharge. Patients who smoke are urged to stop smoking and exercise is increased gradually as determined by follow-up evaluation. An intentionally and artificially induced pneumothorax, used to facilitate transcutaneous mediastinal biopsy and, infrequently, to treat pulmonary tuberculosis and pneumonia. Pneumothorax allows the diseased lung to rest temporarily. The lung collapses when the air enters the pleural space. Scattered adhesions may afford only a partial collapse. Effusion may occur in about one third of the cases. Hazards include pain, infection, and respiratory distress. Pneumothorax that occurs during menses and resulting from endometrial implants in the chest, e.g. along the diaphragm or in the pleural space. 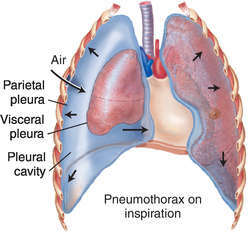 The formation of a pneumothorax by introducing air into the space between the pleura and the inside of the rib cage. A pneumothorax that is not detected by physical examination of the patient or by plain x-rays but is identified instead by other means, usually a CT scan of the chest and abdomen. The condition may be life-threatening. A pneumothorax in which the pleural cavity is exposed to the atmosphere through an open wound in the chest wall. The spontaneous entrance of air into the pleural cavity. The pressure may collapse the lung and displace the mediastinum away from the side of the lesion. Although some patients with pneumothorax have few symptoms, most people who come to clinical attention report the sudden onset of left- or right-sided chest pain, often accompanied by shortness of breath. Breath sounds may be absent on the affected side, or the lung percussion note on that side may reveal increased resonance. 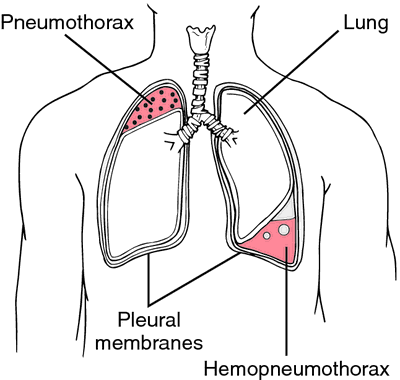 A type of pneumothorax in which air can enter the pleural space but cannot escape via the route of entry. This leads to increased pressure in the pleural space, resulting in lung collapse. The increase in pressure also compresses the heart and vena cavae, which impairs circulation. The patient is assessed for evidence of respiratory failure or the need for immediate intervention. The development of tension pneumothorax is a medical emergency; if it is not promptly relieved, the patient will experience inadequate cardiac output and hypoxemia (and may die). To prevent rapid decompensation, a large-bore needle is inserted emergently into the pleural space at the second intercostal space, mid-clavicular line (needle decompression, needle thoracotomy). This temporizing procedure must be followed by thoracostomy tube placement and water-sealed chest drainage unit. The presence of air in the normally potential space between the two layers of the PLEURA (the pleural cavity). This may occur spontaneously from the rupture of a CONGENITAL bleb on the inner layer, or may result from air access from the outside through a wound. Pneumothorax causes the collapse of the lung on the same side. In minor cases there is recovery without treatment, but the air may have to be withdrawn through a tube. air in the pleural cavity, between the chest wall and the lungs, either by escape from damaged lungs or by entry from outside with a penetrating injury. Causes compression of lung tissue and potentially respiratory distress. Can occur spontaneously, especially in the young, as a complication of lung disease or in sport, most commonly as a result of direct trauma. May also occur by barotrauma in scuba diving and flying at altitude. Symptoms include sharp chest pain and shortness of breath. Diagnosis is clinical, confirmed by chest X-ray. If small, usually heals spontaneously but if larger and symptomatic may require the use of a chest drain to re-expand the lung. If recurrent, may require surgery. 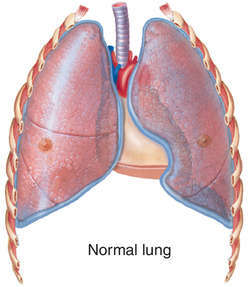 n an abnormal condition characterized by the buildup of air within the space between the lungs and the chest wall; as a result, the lung is unable to expand properly during respiration and eventually collapses because of the increased pressure. Symptoms include chest pain and shortness of breath; although rare, it is a potential complication of acupuncture treatments. Presence of free air or gas in pleural cavity. n an accumulation of air or gas in the pleural cavity. The air enters by way of an external wound, a lung perforation, a burrowing abscess, or rupture of a superficial lung cavity. It is accompanied by sudden, severe pain and rapidly increasing dyspnea. entry of air into the pleural cavity in sufficient quantity to cause collapse of the lung and consequent respiratory embarrassment. If it is unilateral there is a mediastinal shift with displacement of the heart to the other side of the chest. Breath sounds are absent from the affected side. air leaks from a discontinuity in the lung into the pleural cavity. artifactual increased radiolucency of the thorax resembling free air in the pleural cavity. may occur following intrathoracic surgery or in association with procedures which involve entry into the pleural cavity, such as thoracentesis or placement of a chest drain. caused by an open wound in the chest wall. due to an unknown cause. 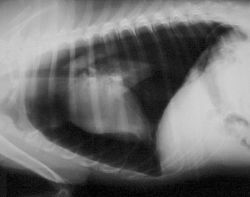 a particularly dangerous form of pneumothorax that occurs when air escapes into the pleural cavity from a bronchus but cannot regain entry into the bronchus. As a result, continuously increasing air pressure in the pleural cavity causes progressive collapse of the lung tissue. If not relieved, it can lead to lung collapse and mediastinal shift. LANDED her in intensive care with deflated lungs and blurred vision.